In large bowl, mix beef, bread crumbs, egg, garlic, salt and pepper. Shape into 4 (4-inch) patties. In small bowl, stir gravy mix and water with whisk; set aside. In 12-inch skillet, heat oil over medium-high heat. Add patties; cook 4 minutes, turning once, until browned. Remove patties from skillet. Add mushrooms and onion; cook 6 minutes, stirring occasionally, until tender. Stir in gravy; heat just to boiling. 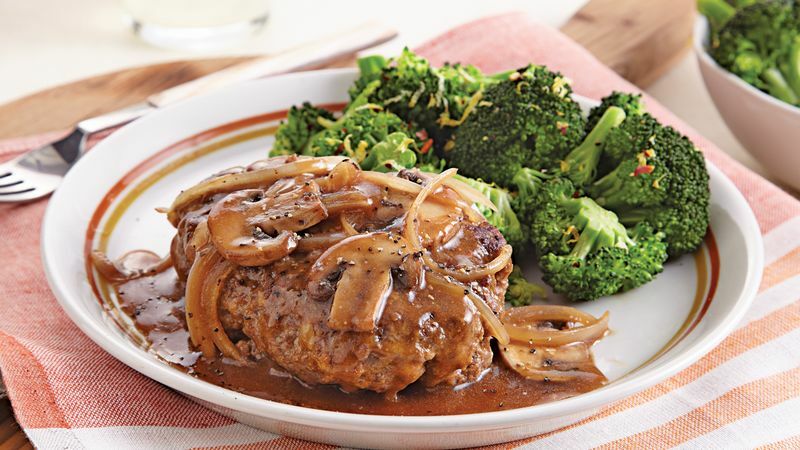 Return patties to skillet; spoon gravy over patties. Reduce heat to low. Cover; simmer 8 to 10 minutes or until meat thermometer inserted in center of patties reads 160°F. To Freeze: Make patties as directed in Step 1; wrap individually in plastic wrap. Freeze in resealable freezer plastic bag up to 3 months. Thaw in refrigerator overnight. Proceed with Steps 2 and 3.